Our display is located directly in front of the Fair Office next to the Tommy Lawrence arena (in front of the flag pole). The Fair is open M-F 8:00-5:00 and can be easily accessed from the East or South entrance. There is no charge to enter unless there is an event taking place. On the left is a 4'x6' pond, 2' high waterfall with 4' of stream. The pond overflows into an underground basin. A 2000 gallon per hour pump is located in the bottom of the basin and recirculates the water back to the biological filter (biofalls) at the top. 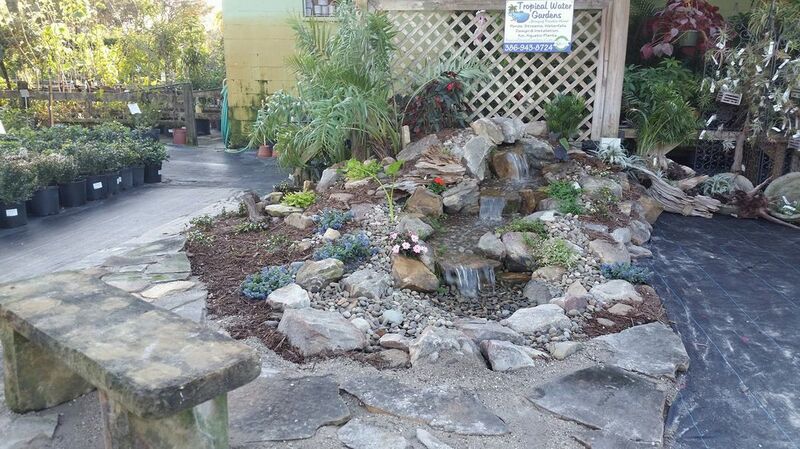 ​On the right is a pondless waterfall, 2' high waterfall with 4' of stream. There is a 2000 gallon per hour pump located in the bottom of the basin that recirculates the water back to the spillway at the top. 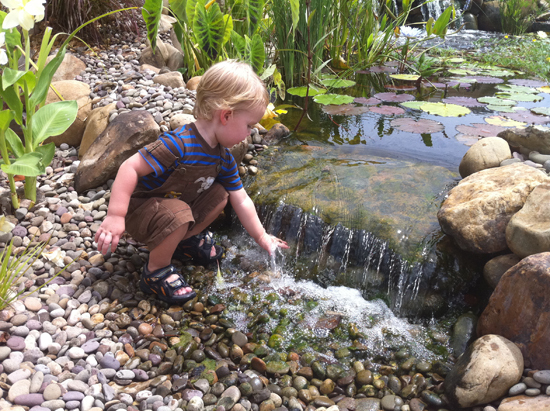 This is a pondless, disappearing waterfall with a 2' high waterfall and 4' of stream. There is a 2000 gallon per hour pump located in the bottom of the basin that recirculates the water back to the spillway at the top.. 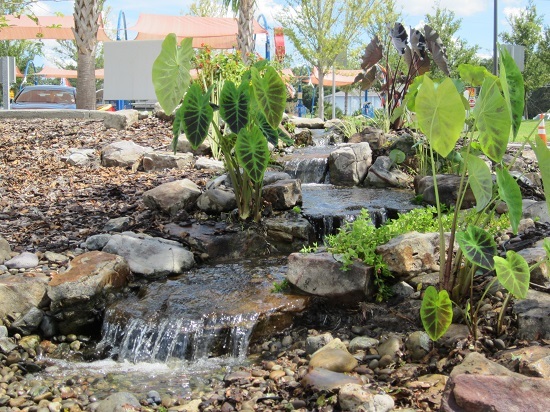 The waterfall is located inside the nursery area. 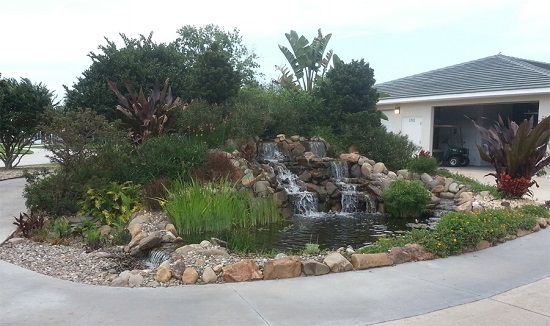 This custom water feature consists of a 5 1/2' high waterfall that is 9' wide. 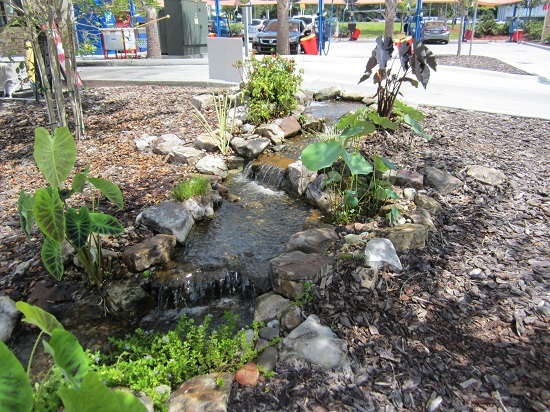 There is an additional 20' stream that all falls into an 11' x 16' Pond ("The Palm"). The pond then overflows into an 1100 gallon basin which houses the 2 pumps (5000 gph each). The Water Feature is located just past the guard gate on the right. You can park in the golf course parking lot and walk beyond the pro shop. 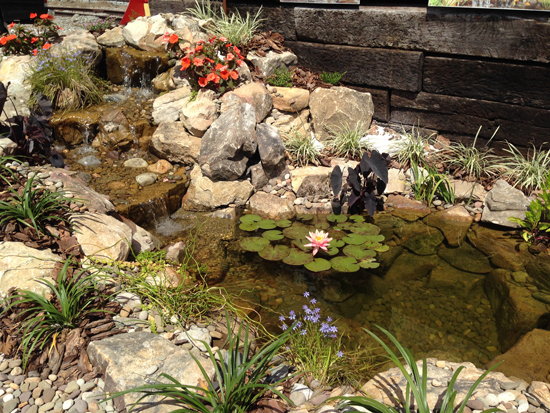 We were hired to remove an algae filled "pond" and install something spectacular! 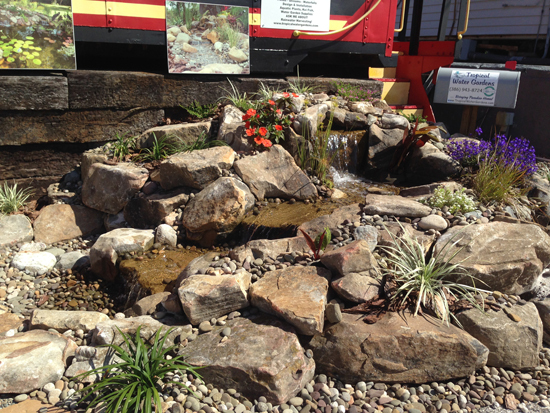 This pondless waterfall is located at Sporty's car wash next to the building and consist of a 15' natural stream set into the side of a hill with the water flowing into a 200 gallon underground basin. The 2000-4000 gallon per hour variable speed pump sits at the bottom of the basin and the water is recirculated back to the top to the spill way. This display also has five LED lights. 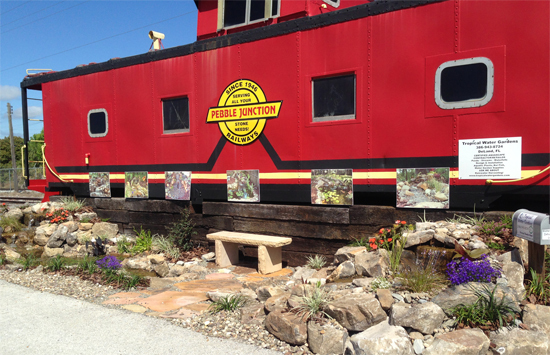 Our display is located in front of the red caboose. On the left is a 4'x6' pond, 2' high waterfall with 4' of stream. The pond overflows into an underground basin. A 2000 gallon per hour pump is located in the bottom of the basin and recirculates the water back to the biological filter (biofalls) at the top. On the right is a pondless waterfall, 2' high waterfall with 4' of stream. There is a 2000 gallon per hour pump located in the bottom of the basin that recirculates the water back to the spillway at the top.